PureRED is a marketing production agency that partners up with hundreds of leading brands and retailers, creating some of the most exciting and innovative content in the United States - ranging from editorial and advertising to pure product photography. What’s so unique about this case study? The fact that PureRED are one of the first agencies on the market running an embedded studio. An embedded studio is one that is located physically in-house, but where the administration and operations are run by an external party. This gives the client all the benefits of having an 'in-house' studio, but without having to worry about equipment, staffing or logistics. More specifically, PureRED operates a studio embedded within their client’s warehouse and distribution centre. This allows products to be shot in an incredibly efficient, industrialized manner - a factory conveyor belt of professional product photography if you will. This gives the studio the unique advantage of being able to interface with their client more quickly and personally - meaning PureRED can easily adapt and scale up their photography output when needed. Now, through using StyleShoots machines instead of a traditional digital photography set, PureRED have been able to ramp up their capacity and are able to shoot three times as many images for their client. StyleShoots machines also take up significantly less space as all of the components are packed in to an all-in-one steel chassis. Meaning no messy wires to trip over or lamps to knock over - which is especially useful when production demands are high and there's no time to waste. Read on or watch the video above to learn all about how PureRED are using StyleShoots to do what few other production agencies have successfully managed to achieve - cut costs, and create even more. "We’re honestly trying to create the most efficient process we can - because efficiency saves money." By making photography an integral part of the logistics process. Time to market is one of the biggest challenges facing all relatively fast moving consumer goods. The longer products are not available to consumers - either through a website or on store shelves - the more money is lost. So how do you shrink time to market? First, it’s all about identifying which stages of the logistical process can be shortened - or even done away with altogether. Check out the image on the left to see a basic overview of where it's possible to shorten a link in the fashion supply chain. The less time it takes to get a product online, the quicker the time to market. we needed something that was going to be far more efficient." Is it possible to reduce delivery times of products? Well, not necessarily. Most clothes tend to sit in a shipping container for weeks when being delivered from factories - but PureRED came up with an idea to remove waiting for delivery of what’s most important to get in front of consumers first, content. Instead of outsourcing product photography to a separate studio where there are added factors of delivery time, cost of transportation and re-sending - PureRED operates as a kind of in-between the two. A photography studio that lives inside the building where the products are being shipped to and from. This means that every day, products to be shot from the client are left right outside PureRED’s studio door. So PureRED’s teams of photographers, stylists and content creators can get instantly to work on preparing, shooting and uploading products to the web - all before they reach the distribution center. A magical one-day turnaround with no extra waiting. "The process through which an item goes to get from a truck to the web is quite interesting. Our client takes care of finding the items that need to be photographed, and they hang those on racks right outside our studio." "The items then are brought over to the photography area. Preppers will prep the items, steaming them. And then our stylists will dress and undress the mannequins - shooting them." "From there, any images and copy we push will be live the very next day." This has the logistical effect of saving on delivery costs, and a tremendous time-saving effect. And at StyleShoots, we’re big advocates of efficiency. Sat within their client's own warehouse and distribution center, PureRED makes use of the unparalleled speed and efficiency of StyleShoots machines to shoot products. As the only machine in the world with such an incredibly low learning curve it's easier than ever before, too. Everything technical can be controlled, previewed and swiped on using the included iPad. First, PureRED's retail client selects the products for the day's shooting. The products are delivered right outside the door of the PureRED studio that sits within the distribution warehouse. The day's schedule of shooting is prepared and the products are catalogued into PureRED's system. They are organised by photo set for maximum speed and shooting efficiency. The products are steamed and prepared for the day's shooting by a team of 'preppers' who make sure each garment is free from defects, creases, lint or dirt. A stylist will then get to work shooting the items. Much of PureRED's product photography is done on ghost mannequins, so they will dress and style them before shooting in one touch using StyleShoots Vertical to achieve a professional 'invisible man' effect. Each image has the background removed using StyleShoots' proprietary tech and is automatically available on the external network folder. This allows retouchers the minuscule task of ensuring that everything is web-ready before publication. 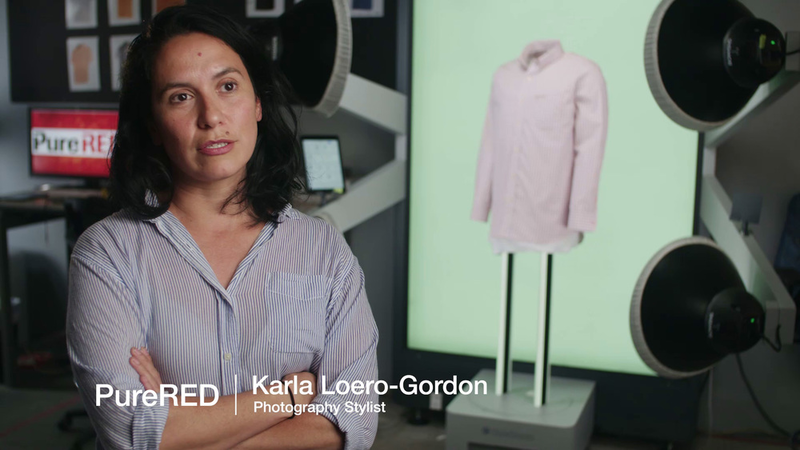 By the very next day, all of the garments delivered to PureRED's embedded studio will have been shot professionally and uploaded to their client's website along with product copy and any other important assets. 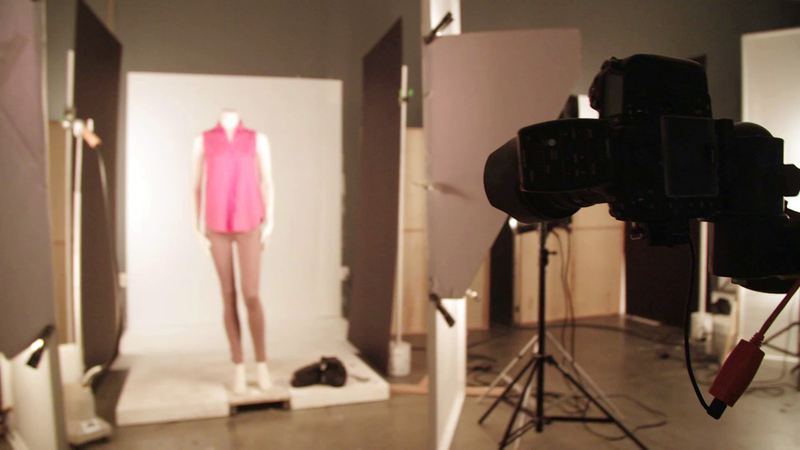 "Any images and copy we push will be live the very next day"
To handle the demands of getting their client's products professionally shot and uploaded to the website within the very next day, PureRED's studio of 1 StyleShoots Horizontal and 3 StyleShoots Vertical machines is crucial to their workflow. StyleShoots Vertical machines have nearly replaced all of PureRED's traditional photography sets - much to the pleasure of stylists who want to get up close and personal with their styling. In a traditional photography set, lots of time can be lost in the daily setup - for example having to readjust tripods and moving light sources throughout the day. 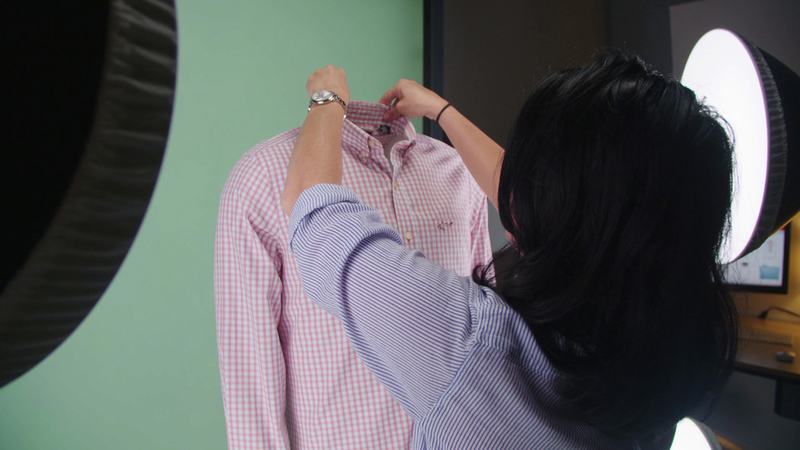 With StyleShoots machines, lighting and exposure presets can be saved to allow stylists alone to get to work instantly. "We can shoot the equivalent of three traditional sets in the same amount of time, but [StyleShoots] only takes up the same square footage as one set." By shooting their articles at a lightning pace, PureRED have been able to upscale their content production efforts by over three-fold. "There's a very short learning curve on the machines. They're very intuitive." 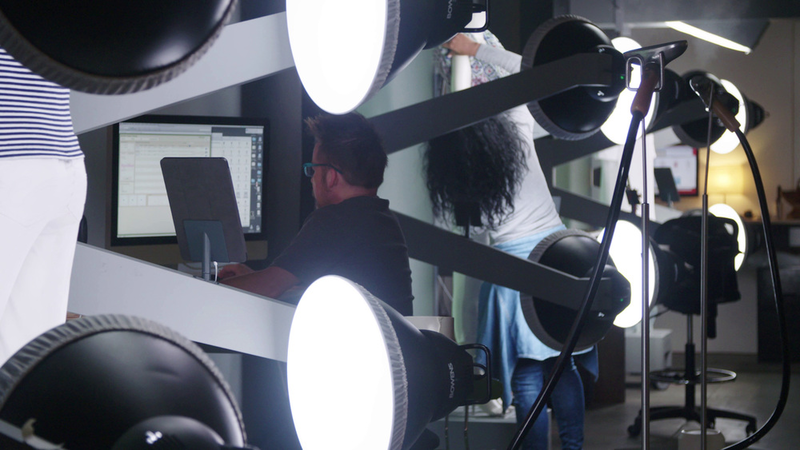 "We were able to have stylists man these systems and have all of the lighting preset for them - so that they're looking, clicking a button and it's done." "So from an operational standpoint, it was a huge labour reducer." "All of it is really great from beginning to end. Essentially I can come in and work anytime I want - not depending on anybody - and doing as much as I want. So, that in itself is pretty great." Allowing stylists the freedom to work alone leaves them time to focus on producing the highest quality shots. Everything can be controlled from the included iPad interface - global light balance can be adjusted on the fly using StyleShoots' award winning LEDs and a shot can be previewed in real time. What's more is that due to the 'very, very short learning curve', new stylists can be trained to use the system in a matter of minutes - ensuring professional quality and consistency every time for PureRED's clients. All that's needed is one button press to shoot an on-mannequin image with the background automatically removed.. The iPad interface then displays a preview and allows a stylist to give the image a name before it is exported to the network drive. we would not be producing as highly as we are now." Why run an embedded digital photography studio? PureRED is a full service marketing and advertising production agency. Ranging from print, digital and branding to studio photography, they deliver pioneering content to leading US brands and retailers including Steinmart, Safeway, Walgreens, Sears, Lowe's and many others. With over 50 years of combined experience in retail and B2B, PureRED creates over 300,000 pages of print advertising, 100,00 digital content pieces and over 89,000 photographs each year for their clients. Always looking to deliver something fresh, intelligent and original. PureRED's main goal is to help their clients strategically position and grow their brands.